Note: Regular articles are still on hiatus. Depending on what happens in the coming months, I may or may not be able to continue it. That said, enjoy this article! Last week, Magic: The Gathering head designer Mark Rosewater wrote about a generic game design tool he termed “narrative equity” in his weekly column. I found the topic immensely interesting, both because it aligns to a great degree with my thoughts on impact and because it codifies an aspect of design that people mostly attempted to add through instinct. I wanted to use this article as a commentary on the methods Rosewater suggests to generate narrative equity–primarily through the lens of designing for standalone games–and discuss a few additional points that weren’t brought up in the article. Note: You should probably read Rosewater’s article before mine. This is essentially “providing players with tools for lateral thinking,” which is a significant part of building impact at a mechanical level as well. The ability to take a component and reuse it in a way that’s uniquely yours makes for a positive, memorable experience. Surprisingly, a game doesn’t need to be complex to be flexible. Hanabiis a very restrained game where the only method of communication is to indicate which cards in a player’s hand are a certain number or a certain color. However, you can use this to communicate a great number of things, like “you can safely discard these cards,” “play this next,” “wait on playing these but don’t discard them,” and “for the love of God, don’t do that thing I know you were thinking of doing”. As you might be able to figure out from this, a “component” could just as easily be a game rule or mode of setup, and doesn’t necessarily have to be limited to physical objects. This is a common feature of trading card games, of course, but they’re also present in the ever-popular “impress the judge” genre. As I mentioned in The Arty of Party, party games are primarily tools for comedy, and comedy is built out of people doing the unexpected. When building Stand Back, Citizen!, I made sure that all of the nouns, powers, and crises generated funny results when used together so players would create new superpowers every time they played. This is something that is much easier to achieve within the boundaries of Magic’s ruleset than in a standalone game. Magic is a fairly interactive game, and its mana system gates players from doing anything too ridiculous until their opponent is able to answer it. Thus, while ridiculous things like the Chameleon Colossus example Rosewater mentions in the article occur every so often, it doesn’t happen enough that a player who knows the trick could style on newer players every time. The other benefit of Magic’s system is that when something absurd happens, the game usually ends quickly. Make a 5000/5000 creature? You win. Deal a trillion damage? You win. Draw your entire deck? Okay, you might lose that one. Even in a circumstance where meeting an unbounded challenge doesn’t result in your victory (like gaining an absurd amount of life), your opponent feels like they can concede. Under a different system, you might go off when the game’s half over, and everyone has to feel like you have an unreachable advantage. Besides these issues, many systems are just too numerically fragile to justify the existence of cool unbounded challenges. But I’m not a math guy so I’ll leave it at that. This is easier to accomplish in some games than others. Many co-op games offer very challenging difficulty levels that provide these “bragging rights” challenges by themselves. While it has the problem that everyone on the table has to be on board to attempt the challenge, it also means that everyone is invested in it and will rejoice should they succeed. “Shooting the moon” is a tried-and-true design tool that can be incredibly fun if implemented correctly. Some players, when they see an opportunity to score big if they jump through enough hoops, will beeline in on it and won’t regret trying even if it fails. That said, the boundary of difficulty has to be balanced carefully: If it’s too near-impossible, players will mostly ignore it, but if it’s too easy, it won’t be narratively engaging. One of my favorite uses of the high-risk, high-reward strategy is the map booty tile in Libertalia. One or two maps do nothing, but three together are worth a whopping 12 points. Collecting map tiles means you’ll often forgo goods and jewels, which are worth less but are far safer, and if in the chaos of the game you can’t get all three, it’ll cost you dearly. In a group of 5 players, three map tiles are acquired about once or twice per game, but the effort required is so huge it’s still massively exciting if you can pull it off. In the right game, effects that outright say “you win the game” (or lose, or tie) are a great method of generating narrative equity. Nothing quite makes one’s eyes bug out of their head as seeing those four beautiful words out of nowhere. Sentinels of the Multiverse uses this sparingly, but when it does, it uses it flavorfully (A self-destruct sequence, a helicopter rotor for a flying fortress that causes everyone to fall to their deaths, a Bat-Mite-esque imp villain) and sets up the possibility for great stories. This is a great idea, and a keystone of some of the best psychology-based games like Codenames, Dixit, and Chinatown. One of the keys that Rosewater doesn’t mention, however, is that the same opportunities should have different outcomes. One of the big selling points of Cosmic Encounter is that players can negotiate with each other in a relatively freeform structure, and penalties for not coming up with a deal require them to actually interact. However, among less experienced players, trades end up being the same thing almost every time: A colony for a colony or, when that doesn’t work, meaningless cards for meaningless cards. If you have a player interaction component in your game, but it’s very obvious what the right and wrong decisions are, players aren’t going to feel like they have the ability to think laterally to exploit a situation that would otherwise be a good opportunity for narrative equity. Obviously, a standalone game can’t hope to achieve the level of customizability Magic and other trading card games boast. But there are ways to make players feel like the choices they make and the experiences they go through are uniquely theirs. In games with asymmetric player powers, my rule of thumb is that there should be at least one and a half times more powers than the maximum player count. (Thus, in a 4-player game there should be 6 powers.) This way, assuming players get to choose their roles and they aren’t assigned to them, you can feel like your abilities were what you wanted and not what was left to you. Even in a game where the design doesn’t allow for asymmetric powers, simply having distinct player colors or factions can help. Epic Spell Wars has a fair number of different wizards in each of its three boxes; even though they have no gameplay effect, the wizard you choose helps cement the narrative and complement your individual style. The theme of your game is also an important way of assuring that players have more opportunities to get stories out of it. Generally, the more mechanics you have to explain, the less interested your audience will be. (This is partially why it’s hard to tell a story about your RPG campaign in an interesting way, because a lot of what happens is couched behind dice rolls that interrupt the narrative.) So a game like chess, which nails the first four numbers on the list, has lower narrative equity because the meaning of what you’re doing is buried underneath layers of theory. Thus, the games with the most narrative equity are ones where the theme is so seamlessly resonant with the gameplay that you barely have to mention what gameplay actions you took. If I told you a story about how I played a Betrayal at House on the Hill game where I played a jock that kicked an alien hypno-spaceship with his powerful legs until it exploded, I wouldn’t have to interject with what my dice pool was or how well I rolled for the story to make sense. Reading Rosewater’s description of narrative equity made me realize how broad my definition of “impact” is. An impactful game doesn’t necessarily have to have the players come away from it with stories to tell; it just has to leave an impression in their minds. Thus, a game like Jenga, which proceeds in much the same way every game, is still impactful because of how much the idea of it remains with you when you leave the table. Both impact and narrative equity have their uses, much like how a bread knife and a petit knife have their uses while cooking. Narrative equity has the benefit of being a significantly more focused term, which allows a designer to add it in a more concrete, methodical way. I hope that narrative equity makes its way into the general design vernacular – entwining the psychological and the mechanical is the best way for game design to move forward as a craft. As most of you reading this know, I was accepted into the finals of Wizards of the Coast’s Great Designer Search. The first step towards doing that was writing some essays. Today, I was informed that WotC will not be posted the essays on their website and that it was fine for me to share them, so here they are. These won’t be particularly comprehensible unless you know how to play Magic, so I apologize. Feel free to ask me for meanings of stuff. Recently, I’ve been watching the Food Network game show Cutthroat Kitchen, a sinister variation of Chopped where contestants bid on sabotages to give the other players during cooking. However, I get frustrated when I see contestants, much better cooks than I am with the ability to change their plans on the fly, make horrible strategic decisions that lead to their self-destruction. I would like to analyze the strategy of Cutthroat Kitchen from a game design perspective and give you the tips and tricks on how to walk out of there with slightly more dignity than the other three. In terms of game classification, Cutthroat Kitchen is a combined take-that/auction game. What’s interesting about it is that contestants bid for sabotages with the money they otherwise would take home. This makes the strategy different from a hobby game, where you don’t care by what margin you win, and even from poker, where you win by completely eliminating every other player. If you scrape through by the skin of your teeth in Cutthroat, you will see measurable losses. So then, we actually have two goals here. The first and more important goal is that you win. The second, less important but still requiring thought, is that you win while retaining as much money as possible. This is where proper threat evaluation comes in. In most games, you evaluate threats based on your opponent’s abilities; in Cutthroat, self-reflection on what would be the most difficult for you is more important, especially because cooking talent and experience are intangibles and not as easy for you to see in an opponent as, say, Risk armies. Thus, you need to know what would hurt you the most personally. Speaking broadly, I would say that weird equipment is the easiest to work with, followed by physical restraints, time-wasters and then by crummy ingredients. It’s rare to see rounds where someone gets assigned weird equipment and isn’t able to work out some ingenious method to cook everything. (The tiny kitchen is an exception and must be avoided at all costs.) Restraints have the most variety in how nasty they are, but generally have workarounds. Time-wasters depend on the assignment and how well you’ve managed your time up until that point; correct me if I’m wrong, but I believe they generally appear mid-round and so you’ll have a good sense as to whether it would be okay or not. Bad ingredients will generally torpedo your entire game plan and are usually the scariest in an episode. Besides the quality of the sabotage itself, the round number is also worth thinking about. One mistake I see frequently is a contestant blowing all their money on a sabotage during the first round, with four contestants. Beyond the obvious issue of not having money for subsequent rounds, the first round has more contestants, which means more people to get assigned the sabotage and more people who could potentially cook something worse than you. Once you’ve figured out what hill you’re not willing to die on, you now have to pick a victim. The best choice is someone who’s already been sabotaged this round. This seems like a terrible idea – it makes you seem like a huge jerk – but it’s the best strategy. Only one person gets eliminated each round, so dogpiling on one person will more often lead to someone other than you getting eliminated than spreading it out. Sabotaging someone who hasn’t been sabotaged yet to “level the playing field” is pure gambler’s fallacy. The next best choice is someone who’s sabotaged you. Cutthroat Kitchen suffers from the problem of a lot of take-that games where firing the first shot is a bad move, as the other players will then deem you an acceptable target. The reverse of this is that if someone’s already given you a sabotage, sabotaging them back won’t draw aggro from the other contestants. It’s also great TV. Barring either of those, sabotage whoever has the most money. If you get to the finals with someone with more money than you, you’re at a disadvantage; it’s better to sculpt the competition so you have the greatest odds possible of winning at the end, where you’re the only target remaining. As I mentioned in my previous article about The Amazing Race, it’s important to look everywhere you can for lessons about game design. I find reality competition shows incredibly interesting because they’re simple enough for a tired person who’s not really paying attention to follow along and create gameplay along axes that are impossible for home gaming to replicate. I will probably never make an exact recreation of Cutthroat in a box, but thinking about its strategy has lead to interesting takeaways that can be used in other – less culinary – applications. PS. I haven’t watched as much as other people, so if you think I got something wrong here please let me know. About a year ago, I purchased the game Nyet! from my local game store. I was interested in creating a trick-taking game that used a lot of the team communication strategies from Bridge in a more simple way, and noticed Nyet! did something similar to what I was looking into. I played several games among different game groups and found it quite fun; one friend in particular, who had a history in semi-competitive Bridge, grew quite fond of it. However, one major problem in the endgame raised some questions with me. What’s the problem? Can it be resolved in a way that keeps the spirit of the game intact? Is it even worth solving? Read on to find out. Nyet! is a simple, cozy game reminiscent of two retired generals arguing over the composition of the perfect lunch. Rounds are divided into two phases, where the second phase is a conventional team trick-taking game. What sets the game apart is its unique first phase, where each player uses a central grid to determine the rules and value of the round. In this section, players decide how many points each trick is worth (including the delightful setting of having tricks be worth negative points), which suits are strong, rules about discarding cards, and even who gets to be on whose team. Players can only individually decide which rules won’t appear, eventually reaching something via process of elimination; thus, the name of the game being Nyet!. This grid segment itself is quite brilliant, and only one small part of it leads to the issues in the endgame: The fact that players change teams every round. Thus, each round, players will accumulate the same number of points as the other players on their team, but at the end of the game they will have different scores and win or lose as individuals. This, in itself, is pretty reasonable. It is the last round of a friendly game of Nyet!. Yelena has 67 points, Astrov has 66, Sonya has 56, and Uncle Vanya has 40. During the first phase, Yelena places herself and Astrov on one team, and Sonya and Uncle Vanya on the other team. Despite having the second-highest score up to this point, Astrov is now mathematically eliminated from winning. No matter how well his team does, Yelena will have one more point than him at the end of the game. Uncle Vanya has also been eliminated because he has fewer points than his teammate Sonya. Sonya, despite being in third at the moment, is the only player who has a chance of beating Yelena because of the team composition. In short, the team composition of the last round in Nyet! invalidates a lot of the rest of the game. Now that we know what the problem is, what solutions are available? The obvious offender is the fact that the game ends after a certain number of rounds. There’s a number of ways you can change the endgame condition while still maintaining the game’s fuctional mechanics: The easiest would be to have the game end once a player or players reach a certain number of points. This would improve the problem, but not fix it completely. If we’re still interested in determining a single winner through a game of Nyet!, say, by having the player with the highest score win after someone hits the threshold, the problem still exists that the lower-scoring players on a team are 100% shut out of winning. Alternatively, instead of having a set end round, you could have it partially randomized. As an example, you could have one card marking the game end in a deck of blank ones; you then shuffle them and draw one each round after a predetermined number of rounds have passed. This solves the problem a little, but it’s still pretty clumsy and could drag the game to unfun lengths. We could also weigh player position so that you gain more points by being on a team with a player with more points, but this would add an element of player politics that doesn’t mesh with the intent of the design. Players are supposed to form teams based on the percieved strength of each others’ hands more than what arbitrary benefit they gain from a previous round. There’s one central problem with all of these proposed solutions, and one that would be surprisingly easy to fix within the context of the game. The problem: People know what everyone’s scores are, and therefore know when they’re bound to lose. The solution, then? Hide everyone’s scores. This technique has worked in more complicated games like Small World to prevent people from ganging up on the first place player. In Nyet!, scores are pretty complicated, and unless you really wanted to remember everyone’s totals, hidden scores would be fairly easy to achieve. This way, even if you are mathematically eliminated in the final round, you wouldn’t know, and you could continue to enjoy a pleasant final round. You’ll notice that this doesn’t solve the strategy of the game in any way, especially if you’re playing with a group of people who love to count cards and whatnot. The thing is, this fix is not aimed at an unsuitable game; it’s aimed at an unsuitable play experience. My experiment in trying to fix Nyet!’s endgame made me reflect on my own experiences finding imperfections in my work. Sometimes, when designing a game, you’ll find a problem that you can’t solve without uprooting something else that makes your game special. And sometimes, the best you can do is try to paste over the problem in a way that will bother your players the least. We’d all like to be perfect designers who make seamless, elegant systems, but in the end, as long as the game is challenging and fun, it’s okay if it has some clunky elements. Some problems are beyond our ability to solve, but it’s important to do your best anyway. Incidentally, if you can think of a better way to solve the problem, please let me know on social media or by e-mail or something. Anyone who’s played a video game in the last decade and a half can attest to how irritating frequent loading screens can be. Though the loading time is often necessary for the tiny people in the video game box to craft the next segment, loading screens detract – sometimes severely – from the gameplay experience. Good thing we’re talking about tabletop game design and that isn’t something we have to worry about, right? Wrong, strawman! Though board games are thankfully safe from having to worry about processing power and rendering and whatever else those video game people have to think about, our own version of loading screens – actions that aren’t gameplay but are necessary for the gameplay to be meaningful – creep into games, at their worst preventing an otherwise enjoyable game from ever hitting the table. This article discusses the most common kinds of “loading screens,” how to minimize them, and why some are more insidious than others. If you think about the times in a game when nobody gets to participate, the most obvious offenders are setup, rules explanations, and scoring. Of these, the rules are the most problematic: A long scoring period comes after players have already enjoyed most or all of the game, and a long setup is only a problem if the game is short enough to make it not worth it, while taking a long time to explain the rules sends many players running for the hills. Games with asymmetric mechanics, like Vast: The Crystal Caverns, especially suffer from this issue. However, you don’t have a lot of tools to deal with long rules explanations because so many games require that all the rules be explained upfront. Nobody likes getting Columboed, but the only way the person who brought the game can stop that from happening is to explain even the rules that apply near the end of the game so nobody feels like they lost because of something they didn’t understand. Similarly, some gameplay elements might be excellent, but require long setup or scoring periods at their core to function. There are also shorter actions that, if they happen too many times over the course of the game, add up to taking a lot of time. Public enemy number 1 here is shuffling a deck of cards; a 30-second process where everyone has to wait for the shuffler to finish can be aggravating if it happens too many times. Though having a “loading screen” in your game may be unavoidable, there are several methods that you can use to minimize them. How you solve this problem in your own design is usually on a case-by-case basis, but I have some scattered observations on problems that crop up most often. There’s several ways to prevent a lengthy rules explanation from taking over the start of the game. In some games, it works best to attach fiddlier rules to cards or similar game components that the players accrue over the course of the game. Elysium, for example, has six or seven ways to use the variety of cards in it, but you don’t need to know how they work until they’re actually out on the board; thus, you don’t have to explain how they work up front. Dungeon Lords has a very interesting way of handling this that I wanted to call particular attention to. At the halfway point of the game, a band of adventurers goes and attacks your dungeon. It’s important to know how this works so you can build defenses, but the invasion is complicated, with a lot of rules. But instead of just listening to whoever brought the game blabber about it, you actually run a short simulation of a combat phase. The simulation is actually fairly challenging, which gives players the sense that they’re accomplishing something when they efficiently defeat that rude cleric going around consecrating everything. For smaller loading screens, you might want to fold them into periods where the player is otherwise not doing anything anyway. Deckbuilding games starting with Dominion made the excellent decision to shuffle your new deck at the end of your turn, meaning that you’ll be done by the time it’s important and you aren’t weighing down the other players. Elegant solutions lower the amount of brainpower needed to play and, more importantly, make you feel really good about yourself. Something else that might help is creating an engagement graph, as discussed in The Arty Of Party, Part 2. In case you didn’t want to read two articles today, an engagement graph is a diagram that shows how much of a player’s time is spent actually participating in the game. You can note it mentally or write it down. This will give you a vaguely more objective way of measuring how much of the players’ time is spent waiting for something to happen than asking the players. You’ll want to start making engagement graphs once you’ve moved on to the blind playtesting, where you observe as someone else reads over your rules and explains them to the other players. This should give you a better sense of how long your game takes to teach, especially without you there to give advice. Long periods of player inactivity, especially for every player combined, can be problematic. Engagement graphs are pretty broad and don’t account for repeated small actions like shuffling, so you may want to make tally marks or something similar if you’re concerned about it. One might think that attempting to keep players 100% engaged is a particular trait of games, or of those darned millennials. But in any creative medium, the deadliest thing that could happen is nothing. A slasher movie doesn’t improve with 15 additional minutes of idiot teenagers partying in the woods, a meal isn’t tastier if you have to eat a bowl of gruel in the middle, and for everyone except me, Snow Crash having pages and pages about the Sumerian linguistic system only dragged it down. By grinding your game to a finely honed edge of engaging play, you can create something that’s better for your players and a better product in general. So start thinking about your loading screens! Modern game design operates on a set of assumptions that don’t work for every game. For example, asymmetric games are supposed to be balanced as closely as possible, but some Cosmic Encounter aliens shut down other aliens’ powers completely. Good games should have little to no luck involved, but Betrayal at House on the Hill is reliant almost entirely on dice rolls and good draws. And yet, Cosmic and Betrayal are generally considered good, fun games. How can this be true? The secret is there are actually two kinds of game, each with their own standards of design: Strategic games and Experiential games. When creating a game, it’s important to think about which one you want, as designing using the wrong method could be fatal. There’s different ways to define strategic vs. experiential, but the simplest way is as follows: Strategic games are a challenge, while experiential games are an experience. In strategic games, the players are challenged to do their best under the infrastructure of the game rules. This will almost certainly create difficult situations which have to be resolved through the players’ wits and, rarely, dexterity. The winner in a strategic game should be someone who deserves it: Someone who was best able to solve the puzzles presented to them. Examples of strategic games include Euros, wargames, most co-op games, abstract games, and anything with an organized play system. In experiential games, the players use the framework of the game to create an engaging experience for themselves. Difficult choices are present, but simple choices that are fun or flavorful are also present en masse. Luck is much more acceptable. A player or players can technically win, and the threat of losing the game adds important stakes, but winning is less important than having played the game period. Examples of experiential games include party games, social deduction games, RPGs, dungeon crawlers, and anything with “legacy” in the title. Like every binary in the real world, the line between strategic and experiential is fluid, and some games, like Magic, hover in the middle ground. Players may also treat a game like it’s the opposite: Take, for example, someone who is very serious about Apples to Apples, or someone who decides to spend a game of Catan building a very long road and doing nothing else. It’s fairly easy to figure out whether you’re trying to design a strategic or experiential game by thinking about it. But if you’ve decided you’re creating an experiential game, how do you analyze and improve it? Good experiential games should rile up your players’ emotions. Laughter is the best, as it means that the players are having fun even when they’re getting their butts kicked, but depending on the game, rage or shock can also be a good sign. Note that frustration is unacceptable, as it has a component of helplessness: Nobody enjoys being bound by the social contract of a game to twiddle their thumbs and do nothing. When observing a playtest, make sure to write down when your players are reacting and how. Post-playtest discussion is also helpful, but sometimes people don’t remember what they felt, especially if the end of the game is weaker than the events preceding it. This next part is more painful: You don’t need to care about strategy that much. As long as your game is engaging, it’s okay if a player wins mostly through luck or if certain abilities are moderately under/overpowered. Your responsibility as an experiential game designer is first to create something that lets your players have fun, and second to create something balanced. Codenames is a great example of this principle. The shifting word grids make it so every game results in different prompts, but occasionally a team will luck out and get four words that are all animals or countries. In a more strategy-focused game, this would be unacceptable, but because Codenames is more about the experience of the spymaster and their field agents than one team winning, exacting balance is sacrificed in favor of a simpler game. Though you don’t need to care about strategy as much, you don’t get off scott-free, as you now have to focus much harder on your game’s impact. This not only means thinking about more unique and memorable gameplay, but the illustrations, graphic design, and even writing of your tabletop game have to be clear, interesting, and cohesive. When creating an experiential game, you should be daydreaming about things you won’t even get to for months so you can design your skeleton in preparation for its flesh. Ideally, all games should be challenging and impactful, but if you have to make a decision between one and the other, strategic games should make challenge more important and experiential games should make impact more important. Unimpactful strategy games like Hansa Teutonica are successful in their lane, as are strangely balanced experiential games like Arkham Horror. Experiential game design is a topic I’ll most likely revisit in the future. These games are a very important component of modern tabletop gaming, but they frequently get swept under the table or, even worse, scoffed at by the kind of enfranchised gamer who most often writes about design. Hopefully, my writing will form the core of a new, more psychology-focused method of approaching tabletop design. Board game design teaches that a game should be fun for a number of repeated plays. A realistic high number for the average game and the average group is 3-5, but every designer dreams of creating a game so addictive that the audience keeps playing for years. This article isn’t meant to contradict the concept of replay value as a whole, but rather a particular idea attached to it: That randomizing mechanical elements of your game will automatically give it increased replay value. This is true on paper, but, very frequently, these changes aren’t enough to make repeated plays feel different from each other. So what’s the problem here, and how can a designer use randomization to make a game with true replay value? My thoughts are below. This Jeremy guy’s a (net)hack! To better understand the issue, let’s look at the roguelike, a popular genre of video game. Generally falling within the role-playing or action role-playing genres, roguelikes are defined by randomly creating a dungeon for you every time you play. The first time you play, you might run into a the boss room immediately; the second, you might encounter a special shop. Obviously, this means that you can play a roguelike forever and never get tired of it, right? Wrong, strawman. The more you play, the less the randomization will mean anything to you. You’ll begin to notice certain rooms appearing over and over, and it’ll feel more and more like you’re simply playing the same game. And in the end, you’re doing essentially the same things: You’re just doing them in different orders. In essence, a lot of games that claim to have endless replay value because the setups are randomized are like a roguelike. I’m going to use Kingdom Builder as an example because some of its printed appeal was that it was different every game: Every game has a new map, set of special powers, and series of victory conditions. However, by your third game of Kingdom Builder, everything’s sort of running together. This is because, despite the randomized components, the core strategy of the game is still fairly similar for every playthrough. Whether you want to create one big clump of houses or build close to water, what’s most important is that you have the freedom to build in as many locations as possible. Thus, the universal strategy is to try to fill out areas and try to remain off as many terrain types for as long as possible. To create real replay value, a game needs to offer truly different routes for winning the game. In the deckbuilding game Trains, players randomly select eight stacks of cards that can be purchased and added to decks over the course of the game. However, depending on the distribution of these cards, the optimal strategy for each playthrough differs wildly. Some setups might encourage wild expansion across the map; some support making huge purchases of costly but powerful buildings. One card in particular, the Mining Train from Trains: Rising Sun, encourages you to build on otherwise useless mountain spaces, flipping the game’s strategy on its head entirely. Ideally, when someone plays your game for the second time, they should feel like they’re having an experience distinct from, but similar to, the game they played last time. The core of the game should be steady in order to reward skill development, but in order to generate replay value, the overall experience needs to feel less like taking a second bite of the same sandwich and more like you’re ordering a different sandwich at the same café. In order to detect this in your prototypes, watch the people who think they know what they’re doing as they struggle with your random setup. Are they doing significantly different things each time, or are they following similar paths? If it’s the former, it’s likely that your audience is going to want to play your game multiple times. Randomizing game elements is not the silver bullet answer to a game feeling stale: It is a tool that, with the use of some other tools, may provide you the solution if you do it correctly. Much like everything else in life, answers are not so cut and dry, but answering these challenges is what’s so satisfying about creation. I’m a big fan of ketchup. I was raised by a Midwesterner and, for much of my childhood, ketchup was the only condiment I’d accept anywhere. Even to this day, when I go to gourmet burger establishments, I’ll dump a bunch of ketchup on everything after my carefully constructed order arrives. This is a shocking opinion, but I’m also a big fan of ice cream. It’s delicious! Cookies and cream is my favorite flavor. So given that I love ketchup, and that I love ice cream, obviously putting ketchup on my ice cream is a great idea, right? Today’s article is about avoiding the design equivalent of putting ketchup on your ice cream. It’s pretty easy to tell, during playtesting, that your game is bad. People get bored or frustrated, individual mechanisms are overpowered or useless, the game lasts for longer than it should. That’s because these are things that give you immediate feedback, the equivalent of a big siren going off. When your game isn’t necessarily bad, but unfocused, it becomes a lot trickier to detect. The individual mechanics of your game might be excellent by themselves, but combined they create a confusing mess. This isn’t something that you can detect by examining final scores, and some players may even give you confusing feedback – depending on the person, they might not mind something unfocused if they had a fun time playing it. The best example I can think of is TIME Stories, which combines an intriguing premise – co-op mystery solving as you play through the same story repeatedly in an attempt to unravel more of it – with dice-rolling mechanics. The thrill of advancing your group game by game conflicts with the issue that you can easily lose the game, even though you did everything right, through a series of poor dice rolls. In a different game, the dice-rolling would be acceptable, or even fun, but here the unfocused mechanics make the game less satisfying. Games can also be thematically incoherent. The game El Grande was originally Troy-themed, with a big Trojan Horse that players could drop their cubes into to hide how many they’re going to puke onto the board at the end of the round. But during production, the publishers changed the name to the political conquest of Spain, with the incredibly thematic Horse changed to a generic “castillo”. El Grande is still one of the best territory control games ever made, but if it had stuck to its original theme the impact would have been dramatically improved. The best solution to focusing your game is to have a clear statement in your head of what you want the game to be. However, the problem is that humans aren’t computers, and we design as much on instinct as we do by writing down several paragraphs in a design document. Your “statement”, might be fuzzy daydreams about some players laughing and having a great time, or a looping gif (pronounced gife) of a character in your game doing something dramatic. In this way, it’s hard to keep a game focused when you don’t even know what to focus on. There’s two ways to approach this, depending on how you’re constructing your game: “top-down” or “bottom-up”, to borrow terms from Magic design. “Bottom-up” designs are created when the designer thinks of one or two interesting mechanics they’d like to explore. In this way, you develop these games by weaving supplementary mechanics and theme around your core concepts in a way that creates a complex, challenging design. The issue arrives when the supplementary mechanics are lifted from more popular genres – for instance, creating an interesting way of placing tiles on a board but deciding that the way to acquire them is through simple drafting because you can’t think of anything better. The best way to keep your bottom-up game focused is to think about what the core mechanic wants. For instance, in our theoretical tile-laying game above, how would it be a challenge for you to get the arrangement that you want? What would generate a feeling of satisfaction when you arrange your tiles in just the right way to shoot past your opponents? What mirrors the core mechanic in a satisfying way? Once you’ve answered these questions, the focus of your game becomes clearer. “Top-down” designs are based primarily on theme. My Happy Daggers, for instance, was made as a way to capture the feel of melodramatic swordfights as you might see in The Three Musketeers or Kenneth Branagh’s adaptation of Hamlet. This makes focusing with your mechanics simultaneously easier and harder: You have a clearer statement of what you’d like to design, but because you’re starting from scratch mechanically it’s a lot easier to drift away from where you started. The most important part of designing a top-down game is its “feel”: That is, making players feel the same when playing your game as they do while watching a movie or reading a book of the same genre. Mark Rosewater, Magic head designer, talked about this approach when designing for Innistrad, the game’s gothic horror/movie monster expansion. The primary feeling you get from a good horror movie isn’t necessarily shock, but dread – the creeping feeling that something’s wrong right before the skeleton pops out or whatever. So the mechanics of Innistrad were aimed at generating the same feelings: Humans which could turn into werewolves on the next turn, any creature’s death triggering a powerful “morbid” effect, spells which could return from the graveyard when you least want it. Innistrad is considered by many to be one of the best Magic sets ever made, which speaks to the power of this approach. Your game will be much better when everything – every tiny mechanic and every scrap of design – is all precisely focused on a core experience. By keeping this in mind while playtesting, the process will probably be more painful – you’ll have to throw out otherwise good concepts because they don’t jazz with the other things you’re doing – but will result in a clearer, more fun, and more impactful game for your players. 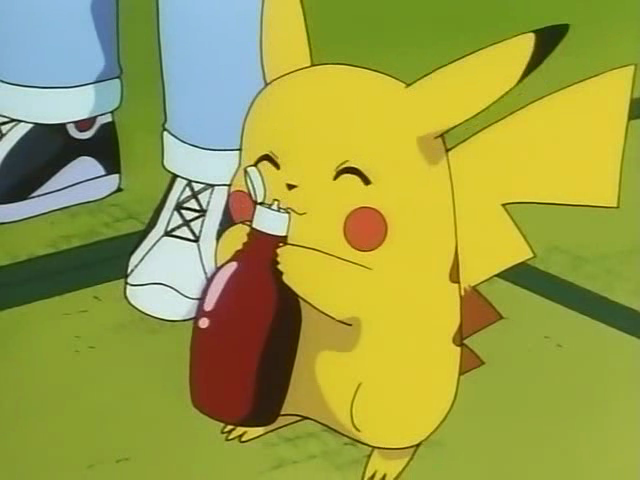 This article went on forever, so as a reward for sticking with the whole thing here’s a picture of Pikachu with a bottle of ketchup. See you in two weeks! I’m tired of going to the game store and seeing the same three themes over and over again. Here are 17 weird themes. Feel free to use them! Assembly Guide/Warning Label. Featureless human shapes assembling/being attacked by geometric shapes in a stark, right-angle-aplenty abstract space. Great for light games! Vegetable Collage. Penguins made out of eggplants! Mighty warriors carved from, I don’t know, a carrot or something! A mountain range in a pumpkin! Fortune Teller Machine. Go to the nearest tacky fortune teller machine and get a fortune. Use the aesthetic of the card as the basis of everything in your favorite project. Yellow Submarine. Not the actual movie, but the same idea of a queasy psychedelic art style and weird critters. What People In The 19th Century Thought The 25th Century Would Be Like. The Everglades. There’s a bunch of cool animals there! 1930s Shanghai. Did you know that Shanghai in the 1930s is a rich setting for noir fiction and intrigue? Now you do. Antarctica. Either “cool ice science” or “blizzardy horror” could work here. Playstation-era 3D graphics. Enough 16-bit throwbacks! Blocky approximations of the human figure or bust! Content Aggregator Site. Collect sets to form an ad-sponsored slideshow! Or take the safe option and make a listicle. Tsukiji Fish Market. It’s a giant fish market with a bunch of loud auctions going on all the time. The potential here should be obvious. Marché Bastille. While I’m at it, how about the gigantic outdoor market in the middle of Paris? Interior Design. Take your tile-laying games to the small time as you passive-aggressively rearrange furniture in one or several houses! Ballet. There’s several theatre-themed games but ballet, IMO, lends itself to board games even better, as it’s easier to judge whether something is following the script. Protestant Reformation. The spread of Protestantism is fascinating, and could have design space for a COIN-style 2 player wargame. 1910s College. Back when football players wore stripy shirts, all professors wore caps and gowns all the time, and the Marx Brothers terrorized the land. I spend a fair amount of my idle time reading/listening to the design philosophy of Mark Rosewater, the lead designer of Magic: The Gathering. One topic he expounds on frequently is the concept of design space: How many viable cards* can be made using a certain mechanic or theme. For a long time, I thought this was one of those things that really only applies to a CCG model, where components are made constantly with no foreseeable end. Then, several months ago, I began working on a board game with Cosmic Encounter-style powers and realized that if I wanted to be able to make as many powers as I want to, I had to think about how much design space I was creating using my core rules. It’s a surprisingly useful topic, but one that isn’t discussed by most tabletop designers, so I thought it appropriate to write about it here. * Design space in Magic can also refer to things like card names, expansion symbol designs, and border colors, but I didn’t want to unnecessarily complicate things. Games with a lot of cards/tiles. Games like Race For The Galaxy hide much of their complexity within the components. Cards and tiles can have special powers – meaning they don’t have to be taught up front – or otherwise provide you some kind of benefit. Games with a large number of asymmetric player powers. Fighting game simulators like Yomi and BattleCON are obvious examples. Party games. As I mentioned in The Arty of Party, one of the most important parts of designing a party game is having hundreds of prompts so players can play many games without encountering repeats. So how do you ensure you have enough design space in your game to make it successful? After deciding to make a game with a lot of exception cases, as mentioned above, you will do a lot of good simply by thinking hard about your game. Look at each rule and say, “If this were replaced or enhanced by something else, but the rest of the rules remained intact, would the game be pretty much the same experience?” If a rule is so crucial that it can’t be altered in any way, it means there’s no design space available for it. The fewer of these present in your game, the more room you have to explore. The previous paragraph is a little abstract, so to use an analogy, it’s like that tired meme about what counts as a sandwich. If you take the top slice of bread off a sandwich, it’s still arguably a sandwich (albeit an open-face one); take off both slices of bread and spread the contents on a bed of lettuce, now it’s a salad. Similarly, there’s no hard-and-fast rule for how much you can alter your core game and have it give the same experience, but rather you have to keep iterating to see what keeps you comfortable. You’ll get better at it the more you keep designing for the game. Finding design space for a party game is more about keeping your prompts diverse. While developing Stand Back, Citizen!, my superheroic pitch game, I found that if I wasn’t careful, I was including too many Noun cards about food and animals. While both food and animals are hilarious, because I wanted to retain a reasonable balance of cards I had to cut down to the funniest of them. In this way, even though I hadn’t technically run out of ideas, the demands of the game at large lowered my design space in these categories. You’ll notice that one topic I haven’t touched on is clearing space for an expansion for your game. This is primarily because I don’t believe in designing anything under the assumption that it’ll do so well that it gets an expansion. With Kickstarter stretch goal content becoming more and more popular, it seems tempting, but creating a game that operates well if a player buys all the content is essentially creating half a game. The other reason I didn’t talk about space for expansions is that most games can find something to add, no matter how rigid the design space. Tzolk’in: The Mayan Calendar literally has no space on the board to put additional content, yet CGE managed to later release the expansion Tribes and Prophecies, which to my understanding was received fairly well. Design space is more important when you’re designing your core game. Your main benefit over current Magic: The Gathering designers is that you don’t need to work in the design space boundaries set by someone else in 1993. You can now apply modern design sensibilities to actively create enough design space for your components to fit in comfortably. By looking ahead and responsibly adjusting the amount of space you have to work with, you’re going to save yourself a lot of hassle later.